Happy April Fools' Day, everyone! While it is traditionally a day for pranks, I'm not going to play any on you - today. Instead I'm catching you up on all the exciting events that have been happening over the past few very busy weeks. Charlie almost "fooled" me into believing he is a quilter! The first big change is our new blog and website. While the website URL hasn't changed, the blog is now on the same site as is our store. We're very excited about these changes and would love to hear your comments on our new look - and any problems you may encounter that we aren't (yet) aware of. 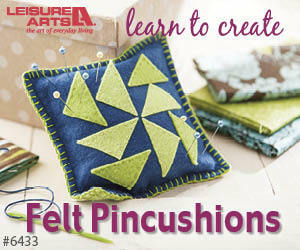 Next, my course, Essential Guide to Fusible Web Appliqué, was released on Curious.com. It was so gratifying to see all our hard work come to fruition and have the course "live" on their website. I have to say a huge thanks to my hubby for filming and editing this course. You did great, honey! Next, I had the opportunity to talk to Brandy Maslowski of Canadian Quilt Talk and do a podcast with her. It was so fun to connect with a fellow quilter and we could've chatted for hours - if we both didn't have quilting to get back to! If you haven't yet had a chance to listen to her podcasts, please do so and consider registering for her upcoming Aloha Quilt Cruise. It sounds like it's going to be lots of fun! Then, just a few days ago, the Spring issue of Quilter's Connection magazine appeared in my mailbox, with my Floral Oval embroidery design in it. I loved how they photographed this design and the colours they used on the pattern pages. I was especially pleased to see the cover quilt by Kim Hanson. It was great to see the two Kims from Calgary in this issue! I've had such a good month, that I wanted to share some of this quilty goodness with you, my blog readers and subscribers, so I decided that a giveaway was in order. I'm giving away a copy of the Spring issue of Quilter's Connection magazine. There are lots of fun designs and information in this issue and if you'd like to win a copy of the magazine, here's what you need to do: become a blog subscriber (you're one already, aren't you?) and then leave me a comment letting me know the best April Fool's joke that you've played on someone - or was played on you. Leave your comment in the area below this blogpost to be eligible for the giveaway. I'll randomly draw the winner on April 7 at 7:00 p.m MST and I will be announcing the winner's name in a future blog post. This giveaway is open to Canadian and U.S. addresses only.